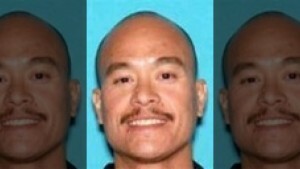 Federal law enforcement officials have captured a convicted felon on the FBI’s 10 Most Wanted Fugitives List. Philip Patrick Policarpio is accused of killing his pregnant girlfriend and her unborn baby in Los Angeles last month, NBC 4 reports. the FBI said Policarpio beat his 32-year-old girlfriend with his fists before shooting her in the forehead on April 12. “Although my daughter’s gone, my biggest fear was, ‘God, I hope he doesn’t do this to someone else,'” Olguin’s mother, Jerilyn Olguin, said after hearing of Policarpio’s arrest. Posted: 5/31/16 at 8:35 AM under News Story.